On a standard day at sea level with the engine shut down, the manifold pressure gauge indicates the ambient absolute air pressure of 29.92 “Hg. Because atmospheric pressure decreases approximately 1 “Hg per 1,000 feet of altitude increase, the manifold pressure gauge indicates approximately 24.92 “Hg at an airport that is 5,000 feet above sea level with standard day conditions. As a normally aspirated aircraft climbs, it eventually reaches an altitude where the MAP is insufficient for a normal climb. This altitude limit is known as the aircraft’s service ceiling, and it is directly affected by the engine’s ability to produce power. If the induction air entering the engine is pressurized, or boosted, by either a supercharger or a turbosupercharger, the aircraft’s service ceiling can be increased. With these systems, an aircraft can fly at higher altitudes with the advantage of higher true airspeeds and the increased ability to circumnavigate adverse weather. A supercharger is an engine-driven air pump or compressor that provides compressed air to the engine to provide additional pressure to the induction air so that the engine can produce additional power. It increases manifold pressure and forces the fuel-air mixture into the cylinders. Higher manifold pressure increases the density of the fuel-air mixture and increases the power an engine can produce. With a normally aspirated engine, it is not possible to have manifold pressure higher than the existing atmospheric pressure. A supercharger is capable of boosting manifold pressure above 30 “Hg. For example, at 8,000 feet, a typical engine may be able to produce 75 percent of the power it could produce at mean sea level (MSL) because the air is less dense at the higher altitude. The supercharger compresses the air to a higher density allowing a supercharged engine to produce the same manifold pressure at higher altitudes as it could produce at sea level. Thus, an engine at 8,000 feet MSL could still produce 25 “Hg of manifold pressure whereas, without a supercharger, it could only produce 22 “Hg. Superchargers are especially valuable at high altitudes (such as 18,000 feet) where the air density is 50 percent that of sea level. The use of a supercharger in many cases will supply air to the engine at the same density it did at sea level. Single-stage, single-speed superchargers are found on many high-powered radial engines and use an air intake that faces forward so the induction system can take full advantage of the ram air. Intake air passes through ducts to a carburetor, where fuel is metered in proportion to the airflow. The fuel-air charge is then ducted to the supercharger, or blower impeller, which accelerates the fuel-air mixture outward. Once accelerated, the fuel-air mixture passes through a diffuser, where air velocity is traded for pressure energy. After compression, the resulting high pressure fuel-air mixture is directed to the cylinders. Figure 7-14. 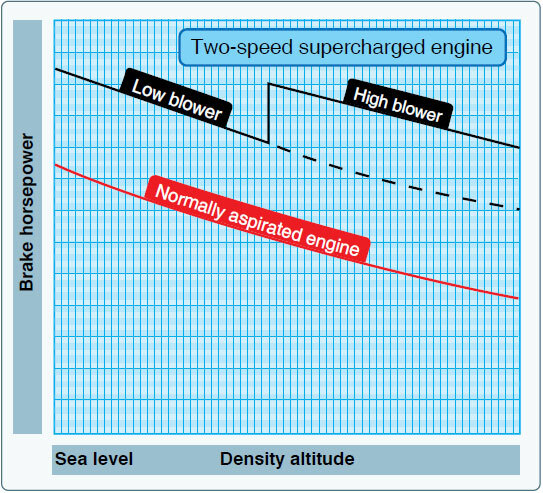 Power output of normally aspirated engine compared to a single-stage, two-speed supercharged engine.